​The Cecilia Moy Yep Scholarship Fund was established in 1994 to award female Asian American high school students﻿, who through their sustained service and leadership, have made a positive and lasting impact on community. The scholarship will help awardees finance undergraduate education. Multiple scholarships are awarded each year. 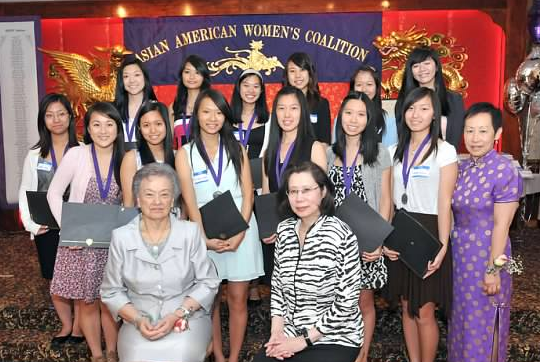 Founders Cecilia Moy Yep (bottom left) and Judge Ida Chen (bottom right) with 2012 President Margaret Chin (2nd row-right) and scholarship recipients. To apply, please download and fill out the Scholarship Application. If selected, you MUST attend the AAWC Scholarship banquet in June 2017 to receive your scholarship. As a service-oriented organization, AAWC expects our scholars to contribute to AAWC through community service. Completed application including the 2 short essays. 2015 or 2016 U.S. Federal Tax Returns. Include Form 1040 or equivalent and W-2 Forms for your parents and yourself (if applicable) . You can remove any schedules or State Tax Returns. A printed copy for your FAFSA (Free Application for Federal Student Aid) Student Aid Report. One recommendation required (from a teacher or community leader). A second recommendation is optional. A) By email - Email your application and supporting documents to AAWCScholarship@gmail.com. The Scholarship Selection Committee will contact applicants they wish to interview in April 2017. The interview will be in person on a Saturday in Philadelphia. You will be asked to provide us with the financial aid award letter for the college/university that you plan to attend. For questions, please contact the Scholarship Selection Committee via email at AAWCScholarship@gmail.com.